As WNBA Players Union Heads To Labor War, Where Is Its Leader? Back in July, at the WNBA All-Star weekend in Minneapolis, a league official sidled up to me and asked me a question. Did I know how much money the WNBA had lost last season? The answer, I learned in short order, was $12 million. At first blush it might not seem like the kind of factoid a league struggling to gain greater market share would be peddling, unasked, to a member of the media. But the WNBA is in negotiation mode. Last Thursday’s long-expected move by the WNBA Players’ Association to opt out of its current collective bargaining agreement with the league laid bare those reasons. Shortly after that conversation at All-Star weekend, I sought out Terri Jackson, the director of operations with the WNBPA. Her union was then just months from a decision to opt out, a natural time for a union president to be out advocating for her members, setting the terms for a battle that would be waged largely in the realm of public opinion. Jackson declined comment, and has just kept doing it. She has declined to make herself available for any interviews, with anyone, to advocate or reinforce the player’s message. As the WNBA’s players head into what may be the most important labor battle in the history of their young league, the union leader is nowhere to be found. Both sides in the WNBA’s labor dispute have their financial arguments, of course. The NBA, for its part, has been clear about both its objectives and its approach. The league claims 70 percent ownership in the league—a 50 percent stake in the league itself, with NBA owners in charge of five of the 12 WNBA franchises. So underlining those $12 million in overall losses and 22 years of investment to the media serves two rhetorical purposes. The first is to let people know that what’s been spent on the WNBA already is considerable; the second is to justify a claim that the NBA shouldn’t invest any additional money in the league beyond what it already spends annually. The players, too, have numbers to cite: When the last CBA was signed, back in 2014, ESPN paid the league $12 million per season for television rights. That number jumped to $25 million by 2017, an annual rate that runs through 2025 and will provide guaranteed additional revenue for many years to come. A union seeking to negotiate a deal with such a league might be inclined to point that detail out, and perhaps to advocate for salaries to keep pace with rising television revenues. That would also allow for the players, who are both the league’s labor force and the product it sells, to reference the league’s rising television ratings. Jackson and her union are somehow not doing any of these things. Instead, Jackson declined one interview after another during the weeks leading up to the opt-out decision, even as the league moved aggressively against any story that even included the point of view that player salaries should increase. 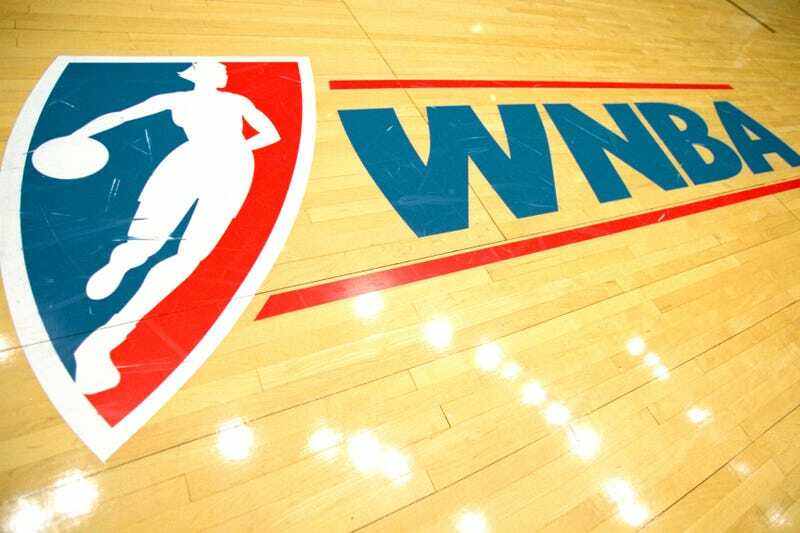 Finally, after holding out until the last possible moment, the WNBPA announced its decision last Thursday morning with a tweet and the simultaneous release of a Players’ Tribune article by WNBPA president Nneka Ogwumike. The union’s argument is embedded within it, but because the piece ran at the Players’ Tribune it necessarily looked different and was received differently than a formal union statement. More to the point, the article also neglected to make the kind of case that stakeholders have been advocating for the union to make. As one source put it to me, a win for the players doesn’t even have to involve salaries at all. The last CBA-controlled player movement to a huge degree, making it virtually impossible for franchise players to move until well into their careers without forcing a trade by sitting out. The league’s salary cap is hard and unforgiving, and lacks the exceptions that the NBA has, like Bird Rights and the annual mid-level exemption. Other enticements that the union might seek include financial rewards to keep players stateside and promoting the league during WNBA offseasons instead of making extra money playing abroad. Another is a codified pathway to work as assistant coaches or front office members in NBA operations. Both would benefit the players and improve the league’s bottom line. Even some basic quality-of-life issues, like improved maternity leave policies, child care, and family rooms at games—something the Phoenix Mercury created on their own—could both rally the public to the players’ cause and give players real quality-of-life wins at minimal cost. The same goes for eliminating marijuana from the league’s banned substances list. Ogwumike did not cite any of those demands or otherwise make an active case for the players’ side in her essay, or when she appeared opposite WNBA acting president Mark Tatum on ESPN’s Outside The Lines. Instead, she focused on the league’s failure to provide the players with details of its broader economic picture. (The league says that it has shared all that information with the PA.) This wasn’t really Ogwumike’s fault, though. Jackson, as the union’s president, is privy to those details, and in a much readier position to push back against specific economic facts of the case. She still hasn’t done any of that. “Radio silence,” as one frustrated longtime writer put it. As it happens, we have a recent example of what can happen when a PA is publicly aggressive—the recent battles the NBA waged with their NBAPA. As it happens, we have a recent example of what can happen when a players’ union is publicly aggressive—the recent battles the NBA waged with their NBAPA. Back in 2011, the league locked out the players and then-commissioner David Stern went on the offensive, making brash declarations about what needed to change to make the NBA economically sustainable. The PA, then led by Billy Hunter, was heard in public mostly through the occasional declaration of its members, such as then-president Derek Fisher. Hunter was so ineffective that he later lost his job as head of the PA amid suits and countersuits over whether he had put his own interests ahead of those of the league. The players lost on virtually every count, signed a deal, and the NBA began a truncated season on Christmas Day. Player share of revenue dropped from 57 percent to around 50 percent. It was a rout. And then came Michele Roberts. Chosen in 2014 over Terdema Ussery, Roberts went on a public relations offensive. She used her new role as a platform for demanding better terms for her members ahead of a chance to opt out of the NBPA’s CBA with the league in 2017. She pushed back on the very concept of salary caps as part of a concerted effort to shift the conversation from where it had been for decades—away from the ostensible shame of egregiously overpaid the players and back toward the question of which parties actually create value in the NBA and how the resulting revenue should be divided. Roberts was also a constant presence in NBA locker rooms, getting her members on the same page with an easy-to-digest argument that they could broadcast themselves—television revenue had gone up, and players deserved to be rewarded as a result. Agents were engaged to understand the specifics as well. This time, the opt-out was avoided and player salaries went up significantly and across the board. What changed, beyond the result, was simple—a strong union head led a public opinion fight and incorporated her members into that campaign. They had a good case, pushed it aggressively, and won. In a broad sense, that may be true. In the ways that Ogwumike’s fellow WNBA players care about most, though, it isn’t. The league doesn’t seem to want to invest any additional money beyond what’s already committed in the league or its players. Tatum, asked about travel, said that he had already discussed it with several players, but reiterated concerns about how much money the league had already spent on the WNBA. He cited the seven professional women’s leagues that have folded during the WNBA’s existence as both proof that the NBA has lent sufficient support and as a sort of threat—those bankruptcies stood in as an ominous harbinger of what might happen if players asked for more. Management’s arguments leave a great deal to be desired in a great many areas, but Tatum was at least advocating for his side. The absence of a counter-argument from the union was as glaring as the absence of the woman whose job it is to make it.